The Kitchen and bathroom cabinets expert at Harbour View Kitchen and Bath list down five edge profiles you can use to make your granite countertops even more stunning. The straight edge profile is suitable for both thin and thick-cut granite slabs. This no-frills design approach is subtle enough to let other elements such as a fancy backsplash or an intricately patterned granite shine while still being elegant enough on its own. You have the option to modify the edges so they aren’t too sharp. Top edges can be slightly rounded to prevent damage and injuries. Achieve maximum visual impact with beveled edge countertops. With a 45-degree clip on the corner, beveled edge profile is one of the most popular granite countertops edges largely because it’s easy to clean and maintain. The waterfall edge profile, also known as riser or infinity edge, is exactly what the name suggests. The slab of granite flows to the side of the counter and spills straight down to the floor, offering an uninterrupted visual. Because they have no sharp corners, waterfall edges are one of the safest edge profile options for families with little children. Choose the ogee edge profile for something a bit more elaborate. This edge profile, composed of one concave and one convex curve, is ideal for kitchen islands. With a rounded top and bottom edge, granite countertops with bullnose edges look great in any room. This profile is also easy to clean and is a good choice in terms of safety. 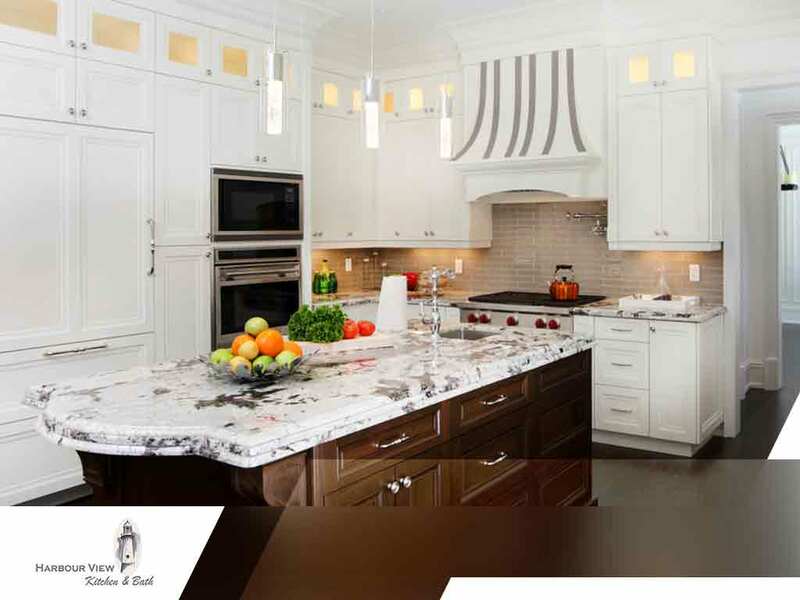 Harbour View Kitchen and Bath offers American-made, handcrafted bathroom and kitchen cabinets. We also specialize in designing and installing countertops that suit your needs. Call us today at (757) 644-0848 to schedule a consultation. We serve Chesapeake, VA.